Jon Kaase earned a degree in mechanical engineering, created race engines that won a dozen Pro Stock championships, succeeded in winning the Engine Masters Challenge six times, and has presided over the company that bears his name for almost 36 years. A dentist’s son, Kaase, 63, started competing in drag racing while still at high school in Cleveland, Ohio. He moved to Atlanta, Georgia at the beginning of 1977 to work for Dyno Don Nicholson and by year end celebrated the move by claiming the NHRA Pro Stock title. 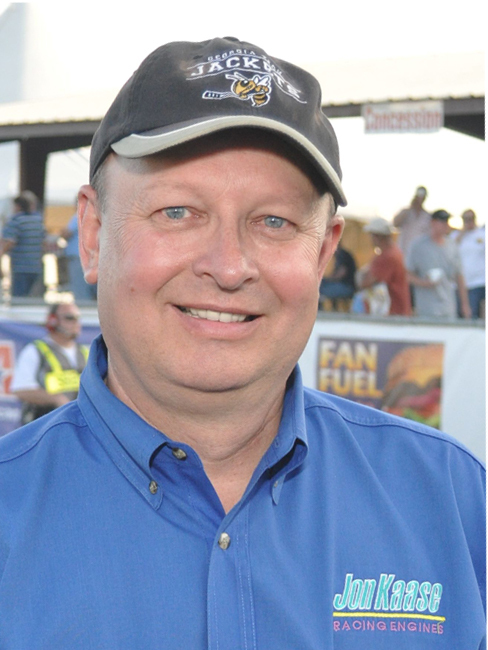 In November 1979 in Norcross, Georgia, he formed his own company, Jon Kaase Racing Engines. Later in 1998 he designed a purpose-built shop and moved his business to Winder, Georgia, from where the company operates today. Around 2007, the firm expanded its operations into the hot rod market when they introduced the Kaase Boss Nine—a high performance engine series developed from Ford’s big-block 385-series and equipped with hemi cylinder heads. In 2010 the P-38, a new high performance small-block series based on the Ford Windsor engine, was introduced. Both engine series continue to enjoy strong sales throughout the United States as well as down-under in the Australasia markets. Though Jon Kaase’s technical acumen thrives at the heart of his company, he relies heavily on his Operations Manager, Cliff Moore, who plays a crucial and interlinked part of the Kaase story. An entrepreneurial type and engine builder with twenty-five years’ tenure at the firm, Moore started college as an engineering student, incorporating CAD design and CNC programming. He also attended the University of Georgia, majoring in business classes. More than an employee of one of the industry’s top players, Moore not only has a firm grasp on race engine development but also has been actively involved in drag racing competition. 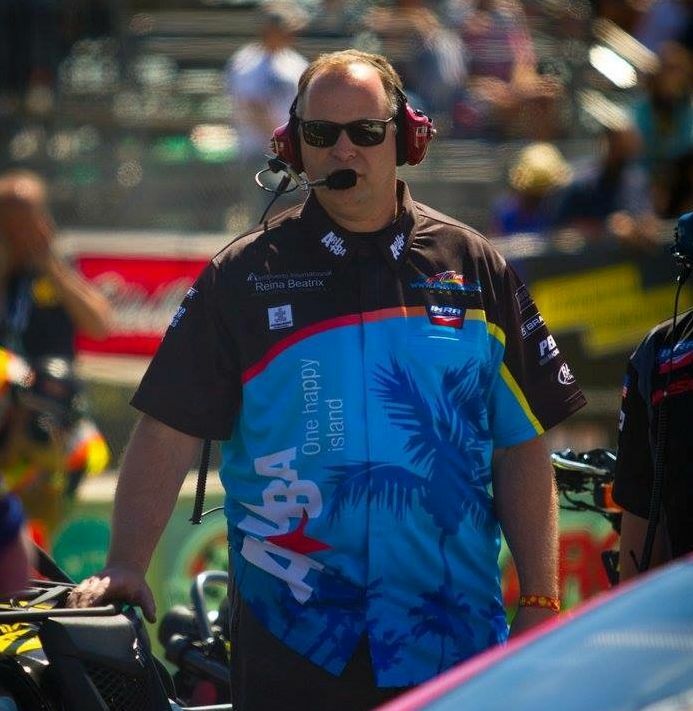 He has served over twenty years as a professional crew chief, including winning 4 World Championships with 3 different Pro Stock teams, tuning the first Pro Stock cars to run in the 6.50’s, 6.40’s, 6.30’s and the 6.20’s and has been nominated and awarded Professional Crew Chief of the Year several times. Today, he remains engaged as a Pro Stock crew chief and also serves as a crew member of an off-shore racing team. To keep the big wheel spinning, Moore serves as board member at various institutions, including a Florida university as well as with an industrial equipment manufacturing company. Gifted with a wry sense of humor, Cliff Moore, in times of recreation is an avid Brazilian Jiu Jitsu practitioner. Among the high-powered team at Kaase Racing is Chuck Lawrence. Born in Atlanta and growing up in nearby Dallas, Georgia, Chuck joined Jon Kaase Racing Engines in 2010. An inquisitive and logical mind and an active drag racer since 16 years old, he gained an early aptitude for building powerful race engines. In competition, he has campaigned throughout the southeast and enjoyed broad success—particularly in Fun Ford and NMRA events with a supercharged 4.6L DOHC Mod motor. More recently Chuck has embraced the popular 10.5 tire classes and his current race car is a twin-turbo big-block Mustang. Derived from an 830cu in Pro Stock Mountain Motor reduced to 642cid using a hemi design and operating on 5in bore centers, the engine is thought to be the first of its kind. 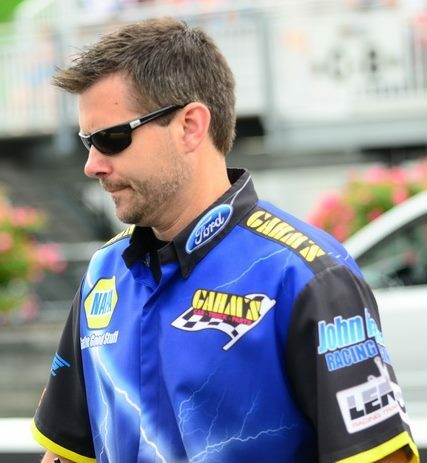 In addition, when time permits he also assumes Crew Chief responsibilities for several Mountain Motor Pro Stock teams. 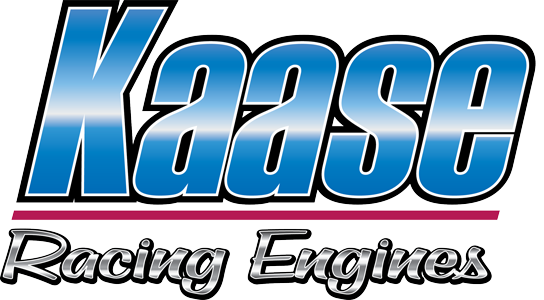 As a Kaase race engine builder, Chuck has lengthy experience in naturally aspirated, nitrous oxide, supercharged and turbocharged engines. His early years were dedicated to building turbocharged diesel Bulldozer engines at John Deere and later he devoted twenty years to engine building at John Bleakley Ford, a local dealership. Born in Asheville, NC, Chris Thomas grew up an hour’s distance southwest in Franklin, and when 18 he enrolled with the Community College in Hendersonville, NC. He studied automotive technology. While there he was encouraged to participate in the ARCA racing series where he served as a front tire changer. It was during this time that the prospect of a career in motor sports entered his head and settled there. After graduation he returned to Franklin taking work at a local Chevrolet dealership. But he soon tired of its mundane daily schedule and by 2010 had accumulated sufficient funds to enroll in an18-month session at the School of Automotive Machinists in Houston, Texas. Of the three courses on offer—cylinder block, cylinder head and CNC-machining—he enlisted in the first two. 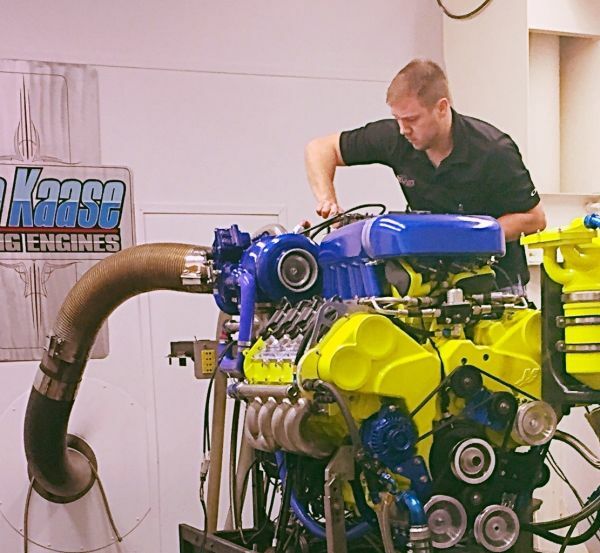 “I quickly learned how much I didn’t know,” says Chris, “and the education gave me the ability to go far beyond where I could have gone on my own.” In May of 2012, Chris Thomas joined the force of Jon Kaase Racing Engines. Chris Howe is a cylinder head porter born in Long Island, New York. A back-room man, if his work, his personality, and his extensive record of success were more widely known he’d be regarded as one of the most prominent head porters of the past thirty-six years. Fortunately, his aptitude for generating efficient airflow within the racing engine didn’t escape the attention of Jon Kaase. As a twenty-one year old, Howe, who had already migrated to the South, was making an impact with Jim Ruggles’ racing outfit in Lithonia, Georgia. Ruggles’ V6 Buicks became regular winners in the Busch Grand National series and as they captured records at virtually every track they raced, the young Howe began to earn a stellar reputation for his contributions. More consequentially, he gained invaluable experience as dominant V6 power triggered the onset of engine restrictions. The 750cfm carburetor was replaced by a smaller 390cfm unit. Then he played a major role in Kenny Bernstein’s Winston Cup restrictor-plate program. Perhaps his most vivid memories from the 1980s revive thoughts of Rich Vogler and the cylinder head developments he pioneered for the extraordinary seven-time USAC National Midget and Sprint Car champion. Howe is a man of remarkable fortitude, even now as he approaches his sixtieth year his work load is undiminished. There’s an old saying about cylinder head porters: “By the time you get good at it you are too old to do it”. How did Chris Howe defeat the odds? He started early! Doug Schriefer is a tuner and presenter with a 30-year involvement in motor sport. Born and raised in New York, the son of an automotive and marine mechanic and commercial fisherman, Schriefer’s early strengths and ambitions were advanced mainly by his mother, an accountant. The youngest of four, he studied engineering at the New York Institute of Technology. He went on to show his versatility in racing Karts and Jet Skis as a teenager and has been involved in virtually every aspect of motor sports since the age of 16. At 18 he found work in nearby Lindenhurst at S-K Speed and remained there for three years. It was here that he came to know the high-performance and racing fraternity. Then came a long relationship with Barry Grant Inc after moving to Georgia in 1993. For 14 years he acted as Head of Technical Services, troubleshooting problems and developing new products. There he gained a deep technical understanding, which eventually led to a relationship with Braswell Carburetion starting in 2007. Engaged as a field service technician he became an accomplished tuner, providing technical support to Pro-Stock and Pro-Modified racing teams. Tuning numerous World Champion racing squads (from APBA offshore through NASCAR, NHRA and IHRA), he has worked at high-profile race tracks around the world from Daytona to the Big Go at Indy, from Dubai to Key West. Doug, now 45, joined Jon Kaase Racing in 2015. He remains involved in drag racing, currently serving as a Mountain Motor Pro-Stock Crew Chief and offshore power boat racing team member. An avid motorcyclist, he runs a Men’s Masters Lacrosse team in his spare time. Born in Livonia, Michigan, Roger Szabo volunteered for military service in Vietnam in 1968. When the eighteen-year-old returned from the conflict, he gained an apprenticeship at General Motors where he worked for the next 39 years as a repairman of industrial sewing machines. But his personality was characterized by racing, a passion he never neglected. In his youth, and living just two miles from Dearborn Steel Tubing, the famed builder of prototype race cars, the young Szabo found his life-long calling. Following his extensive service at GM, Roger moved from Michigan to Gainesville, Georgia, where his daughter lives, taking work at Jon Kaase Racing in the Tech and sales department. To say that Szabo is a successful drag racer would be an understatement. In the early nineteen-seventies, he raced a Chevelle and a Road Runner but his first serious attempt came in the form of a Super Gas Chevy Vega in the mid-seventies. Currently, he and his 46-year-old son, Keith, campaign a 1993 Mustang, purchased from the late Steve Grebeck. Powered by a twin turbocharged big-block Ford that he built in Kaase’s shop with Jon’s assistance, he’s been racing the car in its current configuration for about ten years. “I like the turbocharged concept. It makes around 3,000hp and is low maintenance, compared to nitrous or blowers. Successful race engine shops often operate within the shadow of one exceptional individual but their supremacy is earned by the quality of the team. With his extensive background in competition, Roger Szabo is an integral part of the Jon Kaase Racing philosophy. Ron Baker is a leading figure in the construction of 800cu in Mountain Motors. He has built over 20 of these formidable Hemi Pro Stock race engines from scratch, which culminated in twelve championships in a dozen years. Could any engine-building shop imagine a more exuberant time? Of course, it was racing and preparing racing cars for competition that structured their lives and Dragway 42 in West Salem was where their pursuits bloomed. Then one day, his life in Ohio was disrupted when Kaase realized that if Ron wished to expand his racing horizons—help unravel the mysteries of the 800cu in racing engine— he should consider moving to north Georgia. It was the mid-nineties. “Jon did all the head work and I put them together,” says Baker. “I line-honed the blocks, assembled them, degreed the cams, and ground them for rod clearance. Though made of aluminum, they had ductile iron cylinder sleeves and grinding rod clearances used to take a couple of days.” By contrast, contemporary billet blocks eliminate those two days of labor, as correct clearances are now included in the machining process. Adept at building both race-proven and high-performance street engines, Baker’s most recent engineering triumphs have included a 427 Cammer—Ford’s overhead cam classic from the 1960s and the construction of two FEs. Unfailingly good company, Baker is a colorful individual, his assessment of technical matters often reflect his laconic and ironic traits in equal measure. To separate his abiding fondness for racing engines, his weekend passions are stirred by roaming the countryside in his motorhome or motorcycle. Logun enjoys diversity at Kaase’s shop and the pleasingly disparate engine-building prospects that lie beyond. Currently, he’s preparing high-performance Nissan GT-R and Porsche engines as well as off-shore powerboat and Pro Stock Mountain Motors. For Smolik, employment at Kaase’s is a hallmark—a stamp of authenticity and he’s gratified to be the latest recruit at the Winder marque and to be part of the team. Ambitious twenty-six-year-old engine builders have no intention of remaining superficial for long. They have already mapped-out their career and make every effort to become good at it. Graduating from High School in 2010, Logun grew up in mid-Nebraska, on a farm near Sargent. The following year, he enrolled at the School of Automotive Machinists, (SAMs) committing himself to a 18 month apprenticeship at the famed Houston training institution. In mid-2012 he found employment at a small engine shop in Colorado Springs, McCabe Motorsports. For over three years, his primary focus lay with the preparation of drag race engines and short track oval engines, operating on both asphalt and dirt. Then In 2015, he moved to Sherman, a small town north of Dallas, Texas. While there he worked on higher-end Bracket engines. But after 18 months, he was seeking change—a leap forward, which culminated in his joining Kaase Racing Engines in February 2017. Farming and ranching could have been Logun’s destiny, but that was not to be. Yet, farms have a just reputation for being the traditional hothouse of ingenuity. For farmers, because of their outlying locations, technology has made sense to them since childhood—they have to rely on their own versatility. So, through his mechanical interests, the engaging passages of Hot Rod magazines, mud and dirt bike racing during High School, he found his path to the racing industry. Hiring can be a precarious business, just ask any competent engine-building shop. 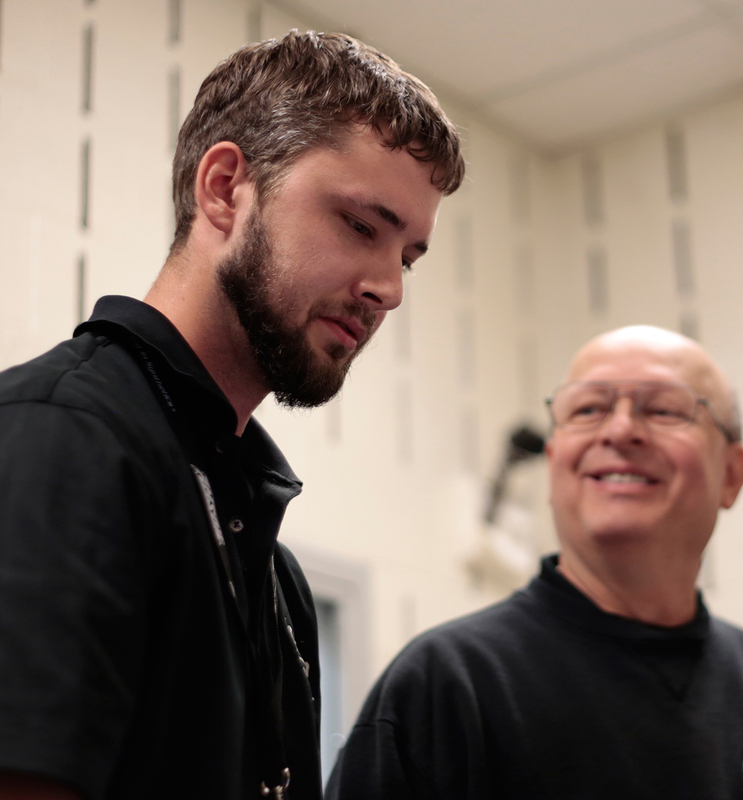 But if a shop is fortunate enough to find reliable talent combined with cheer and good manners, it’s quite the bonus—an event that strikes a welcome chord of optimism within the entire team. Evan Torrence is twenty years old. Born in Decatur, Georgia, and growing up in Lawrenceville with two sisters, his Dad sells granite, his Mom a practicing attorney, and Evan’s greatest desire is to work in a race engine shop. Attending Lanier Tech in nearby Gainesville and engaged in their Motorsport Technology program, Evan began work at Kaase’s in February 2017.